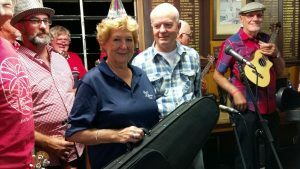 Brisbane Ukulele Musicians Society Inc (BUMS) packed Coorparoo Bowls Club on Wednesday 3 May to celebrate 10 fabulous years of sharing the joy of ukulele. It’s a wonderful coincidence that in our 10th birthday year, we’re also hosting SPRUKE — 2017. In the months preceding the birthday celebrations we held a fundraising raffle for this years festival. Our generous sponsors Kanile’a ‘Ukulele donated a stunning K-1 Premium Tenor model- featuring a select curly koa body, rosewood fretboard and bridge with a hard shell plush case…aaah we all wanted it! 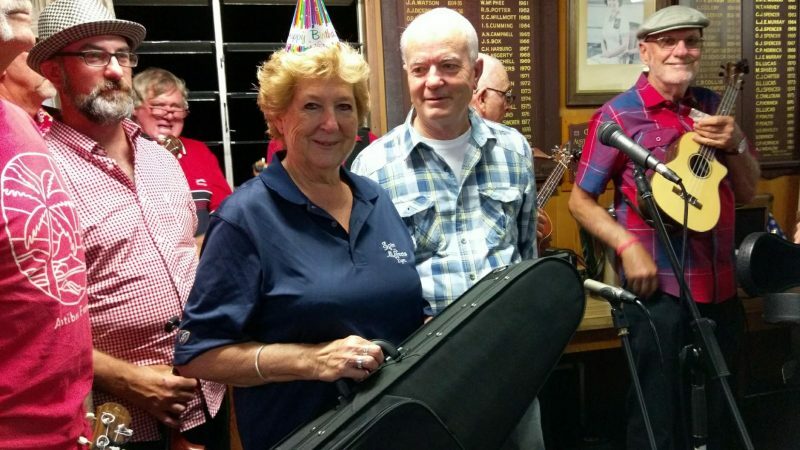 The lucky winner is Lyn Barron, who had plenty to celebrate at the birthday jam and proudly took her prize home. Thank you to all the loyal and supportive ukelists who entered the raffle. Thank you also to Joe and Kristen from Kanile’a ‘Ukulele for their generous support of SPRUKE. We had a surprise visit from Joe Kelly the State member for Greenslopes, who popped in to celebrate with us, wishing the society continued success. Thank you Joe for your ongoing support of SPRUKE, Brisbane’s Ukulele Festival. One of the highlights of the night was a reading of ODE to BUMS. Written by David Megarrity (of Tyrone & Lesley) who bestowed the acronym BUMS upon the Society, it was read by Ross Clark (Daylight Moon, Bumsteaders, and Original Performing BUMS) to the delight of the packed room. We are thrilled that Tyrone & Lesley are now confirmed as SPRUKE 2017 headliners joining Kyas Ryo (Japan), Ukulele Russ(Alaska) and The Pockets(Australia). You can see them all at the opening night concert ‘Spruketacular’. An extra treat, Tyrone, fresh from his appearance at one of the world’s best ukulele festivals –the Grand Northern Ukulele Festival in the UK, will bring his own touch of brilliance as MC for Spruketacular on Friday night. 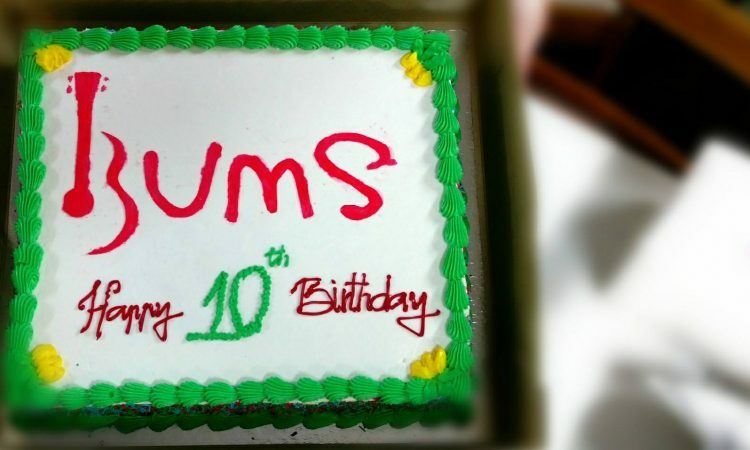 The 10th Birthday Jam also featured performances from performing BUMS bands The CAGE, The Free Range Chukes, The NUMB BUMS as well as a set from The Original Performing BUMS back together for one night only. Many of these performing members of BUMS have gone on to contribute their time and energy to further the aims of BUMS in the wider community by forming new community bands, organising and leading jams and performing at fundraising events. After 10 years Brisbane Ukulele is going stronger than ever, and after experiencing all the talented BUMS who performed on the night, and seeing all the ukulele enthusiasts and BUMS members who packing the top floor of Coorparoo Bowls Club SPRUKE 2017 is shaping up to be the best festival yet! Read the potted history of BUMS Inc here. More images on the BUMS Facebook page.